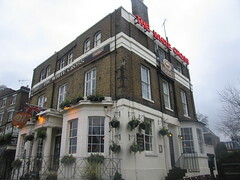 Young's pub in the Good Beer Guide, by the riverside in Richmond. When the tide is up, the pub can get cut off (photographic evidence), but they have a dinghy for emergencies I believe. According to the website, food is served until 9:30pm (and roasts until 8pm on Sunday). Not recently visited by an RGLer. Last edited 2013-09-12 23:58:02 (version 21; diff). List all versions. Page last edited 2013-09-12 23:58:02 (version 21).